Where to start ... Waterfalls - I like waterfalls. I once detoured across half of South America by bus and train to get from La Paz (Bolivia) to the absolutely incredible Iguazu falls which are on the border between Brazil and Argentina and not far from Paraguay either. Niagara falls are maybe the most visited in the world. I've been there too, and it's quite nice, that little boat ride on the Maid of the Mist. I tell you what - you can't do a boat ride at Iguazu! Certainly not when I was there in wet season. An unbelievable torrent of chocolate brown water was shooting from the jungle. One of the most amazing places I have ever been and well worth the ride on the "Train of Death" to get there. (above) Iguazu falls - not in Phuket. Sorry for the non-Phuket photo. But I really do like waterfalls. The waterfalls in Phuket seem to be mentioned in just about every guidebook and website (and blog), and if you like nature and like to get away from the majority of tourists who like to stay at the beach, then Phuket has a number of waterfalls, all of them jungly and quiet, which are worth a visit maybe as part of a tour, or worth a look as you explore the back roads, but I would not say that you devote a day to a "Phuket Waterfall Tour" unless maybe you live in Saudia Arabia or some other dry country and you have never seen a waterfall or jungle. Don't be expecting anything like Iguazu, but you can get a nice little jungle walk and maybe take a swim in the fresh water running off the hills. Phuket has hills that rise up to over 1700 feet above sea level, and yes, we do get quite a bit of rain too. And so Phuket does have some waterfalls! Only a few kilometres from where we live is the highest point in Phuket, over 540m above sea level, and near this hill you have Kathu waterfall. It's only a short drive from Patong beach into the Kathu area of Phuket. The road up to the falls is a residential area, we have many friends up this road. There's space to park at the end, you cross a bridge and start walking up some steps .. and up.. and up... you can climb for quite a long time and get nice and sweaty! There are several cascades as you climb and locals are always there playing and swimming. In the northeast of Phuket island is a large green area which is designated as a National park. It's called Khao Phra Thaew, and on each side of the 1,000 foot jungle covered hill in the middle are 2 waterfalls. There is Ton Sai on the West side and Bang Pae on the east. In between is pretty wild country - I have read that you can hike between the 2, but a friend of mine (who is a real fit hill runner/marathon runner/hiker) has done it and tells me it's tough, and he was attacked by a wild gibbon up there! Ton Sai is easy to find - turn right at the traffic lights at Thalang Town (right if you are heading north). Follow the small road. I believe entry is free after 3pm. Don't quote me on that. Otherwise 200 Baht. There is a nature trail and again several small falls up the jungle path. And on the way there you are really in rural Phuket, so close to the main tourist beaches but in another world. I've blogged Ton Sai twice - A walk at Ton Sai Waterfall in 2011 and Ton Sai Waterfall in 2007. And on the other side of the hills from Ton Sai is Bang Pae Waterfall - and also the Gibbon Rehabilitation Project. Actually the Bang Pae area is one of our favourite in Phuket. Lots of little back roads, some great rural scenery, huge areas of rubber plantations, pineapple fields, and a few restaurants that we like too such as Bang Pae Seafood and Peang Prai which is just at the entrance to Bang Pae - again, there is an entry fee here of 200 Baht per person. Note that the entry fee does not go to the Gibbon project which you can visit for free, and a small donation is appreciated there. Bang Pae is very popular with locals at the weekend. There are several small restaurants just inside the entrance, and many people come here for a splash! (above) Kids playing in a pool under Bang Pae Waterfall. Back in 2012 we found a new place, and we visited again twice in 2013. We were driving back to Phuket from Khao Sok National Park and decided to look for Sri Phang Nga national park. A friend had posted some photos on Facebook, it looked good and seemed to be not far off our route (but far enough to call said friend and ask "where the **** is it?"!). Sri Phang Nga is not in Phuket, it's in Phang Nga province, you have to drive from Phuket via Khao Lak to Takua Pa and then on northward towards Kuraburi. About 30km from Takua Pa is the turnoff and then you have about another 10km on a narrow road, becoming a dirt road.. no wonder it's not well known! And here we found a really superb waterfall called Tamnang Waterfall, with a cool fresh swimming pool beneath it filled with fish which will swim freely all around you! Great! (above) Tamnang Waterfall at Sri Phang Nga national park. The park has more falls which need a bit of a hike. We'll explore again sometime soon! 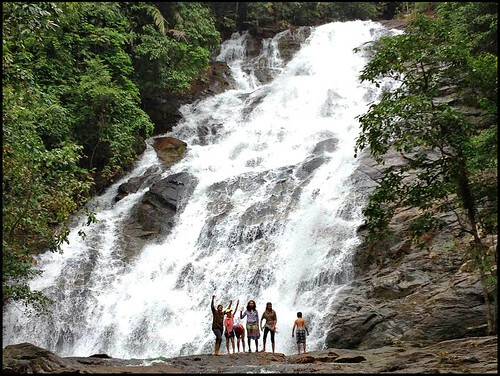 We based ourselves at Khao Lak for a few days in April/May 2013, and again a few months later and visited a couple of waterfalls. Ton Prai is certainly worth a visit, and it's better after some rain. In April, at the tail end of the dry season it was still pretty good, but in July - wow! It's about 30km south of Khao Lak, or 30km north of the Sarasin bridge that connects Phuket to Phang Nga. It's a jungly up and down hike of about 800m from the visitors center to the waterfall. 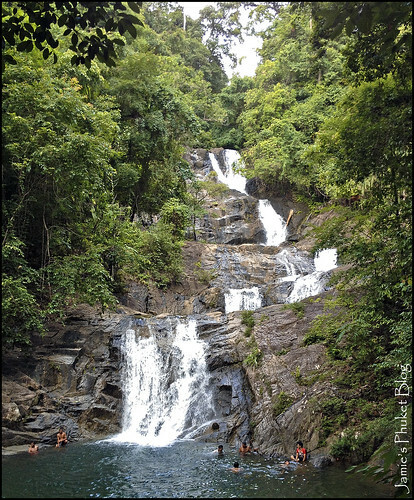 Just a few km north of Phang Nga Town, Sa Nang Manora does not have any huge waterfalls but is a very nice relaxing spot in the jungle with several small cascades where local folks like to relax. Great for a picnic, a splash in the cool water on a hot day, easy to fit in a visit here if exploring the Phang Nga area. Lampi is not far from Ton Prai, just a little bit closer to Khao Lak. Amazingly, we had never stopped here until 2014! Lampi is a little more crowded than Ton Prai, since you can park very close to the falls, there's no hiking involved, plus there's a little shop and restaurant by the carpark and even a place to buy swimming shorts :) And the waterfall is pretty impressive too. There's a pool for swimming under the falls. 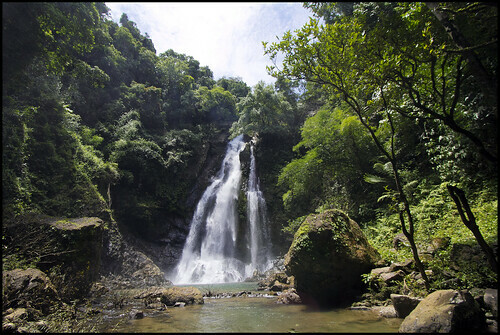 Only about 10km north of Phuket Island, just outside the town of Khok Kloi, we found Wat Khao waterfall in 2016. Must have driven past the sign many times, but never visited and it's very nice! Not too spectacular, but tumbles down the hillside in a pleasing manner and has pools for swimming, plus a restaurant with great local food. 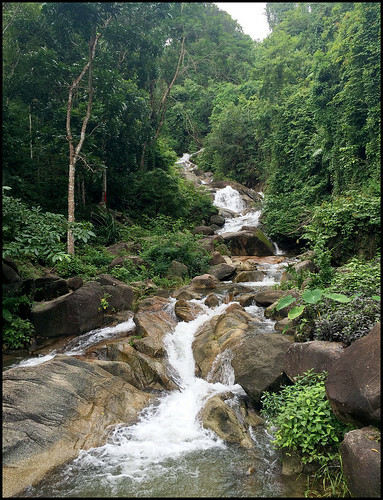 There are a few other little waterfalls around Khao Lak, and I have also read about a small waterfall in the hills near Kamala Beach and a waterfall at Manik (on the other side of the hill from Kathu waterfall) - we tried to find it one time but only ended up driving up a narrow track which needed a 27 point turn to get down again! There is also a place called Raman Waterfall Park which is near the Wat Suwan Kuha (temple in a cave) near Phang Nga Town. We stopped once at Raman but had no time to explore... one day.. there is always more to explore in the Phuket area and not enough time!! !